The plump older woman plucked the bottle of Coke from my hand. In a quick jerk, she moved away from me, and then, did an about-face and stared me dead in the eyes. “It’s not alright,” she pronounced again and proceeded like a bullet toward the building, disappearing from sight. Unaccustomed to my drink order being of such importance, I thought ‘what a good thing that such a little thing mattered.’ It wasn’t lost on my traveling companions; as we enjoyed a respite from our jam-packed adventure in a van where there’s never enough room, the woman weaved her way about the small group, smiling and laughing as if we were friends she hadn’t seen since the last time we craved sticky buns and fresh baked bread. As quickly as she had appeared, she was gone. We sat patiently at the four picnic tables adjacent to the building that were more suitable for summer’s sunshine than winter’s chill. Even though sun beat down upon our faces and the calendar labeled the day spring, our chunky coats confirmed that winter wasn’t ready to let go. Every few seconds, I would shiver, pulling my bubble coat closer to my body, thinking it was a streak of good luck that I even packed this beauty. Ten seconds later, the woman reappeared, a Diet Coke in one hand and an assortment of salad dressings and utensils in the other. She seemed undeterred by the weather or the requests. Gluten-free, meat-free, dairy-free—she turned the complicated into routine. She held out the drink to me, showcasing satisfaction with her big, brown eyes and cheeky smile. I took the soda, half expecting her to chastise me for accepting anything less that I wanted. I watched her chest lift and lower, out of breath as she attended to the wants of her new-found friends who had arrived for lunch. Moving past me, she asked each person if they had what they required, and if not, she turned quickly and retreated into her bakery, rebounding within seconds with the appropriate sauce or bread. It was like watching Santa concocting magic on Christmas Eve, turning and jerking and filling with a single purpose in mind. Honestly, it was exhausting, and I couldn’t wait to see what her return would bring. Finally, bellies were full and curiosities ran high as the conversations leaned toward the legendary crooked pies (pâté croche) and nun’s farts (La Pets de Soeur) that delivered people from all around the world to this petite bakery perched alongside the St. Lawrence River on the small island of L’Isle-aux-Coudres in Charlevoix. Today, we were her people. I inhaled my meat pie and fresh-baked bread, both melting away the chill, and I wondered if there would be room for more. And like clockwork, the woman appeared, with hands overflowing; in one hand, a sugar pie (Tarte au Sucre); in the other, nun’s farts (La Pets de Soeurs). Her stories became the proverbial icing on the cake. With the aid of an interpreter when the words became too challenging, the eager woman transported us into the middle of the frosty river where the legend of the crooked pies was born. 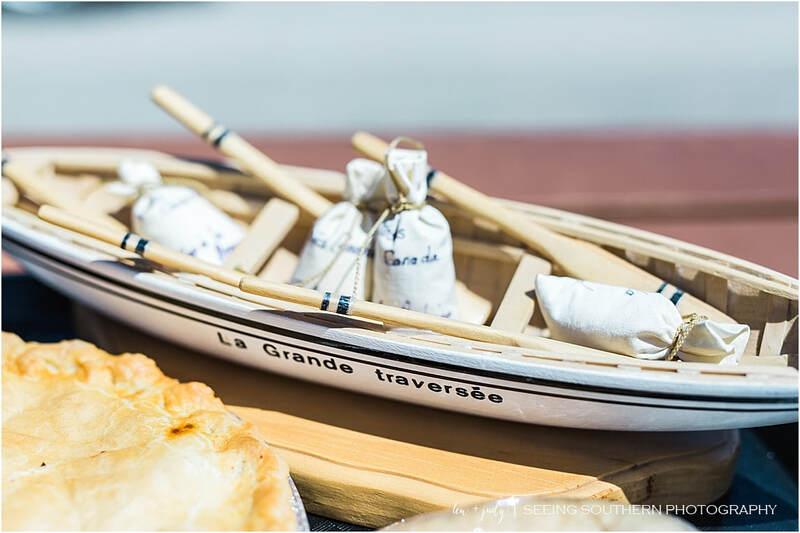 In a beautiful French Canadian cadence, the bakery’s owner Noelle-Ange Harvey told of fishermen in canoes crossing the rugged St. Lawrence River, long before the ferry arrived in 1930, taking them to their ships. She reached out in front of her with one arm, swishing from left to right, imitating the wave’s angry movements. In the other hand, a perfect rounded pie matching the pace of the other arm, balancing the object like a ringmaster balances his top hat. And with that, she smashed the pie she cupped in her hands into mirroring sections, sending gasps among all glued to her story. “See, not looking so good.” Everyone laughed as the woman, using appropriate French and English expressions to reveal the new dilemma, tossed her folded pie on the table. What was once a pie was now a crooked pie, which she now fills with beef, pork, veggies and a cereal type of filling. It was now, a hand-held masterpiece, an easy meal suitable for rough waters and crowded van rides. After the tale of the meat pie, she progressed to sugar. Little did we know, this iconic Canadian sugar pie, very similar to a custard, and the nun’s farts, pinwheels made of left-over dough and drizzled with cinnamon and sugar, were about to trump those meat pies. As we succumbed to their sweet power, Noelle told of, when in 1929, an orphanage welcomed nuns who had arrived to share sweets with the children. As one nun left the room, a noise followed, and one child responded to what was every child’s whispered query, “It’s a nun’s fart.” Everyone, including Noelle, giggled; we were certain the children giggled, too. At least, that is one story that connected flatulence to pastry. Some say it’s the sound the dough makes while frying. I chose Nicolle’s version. 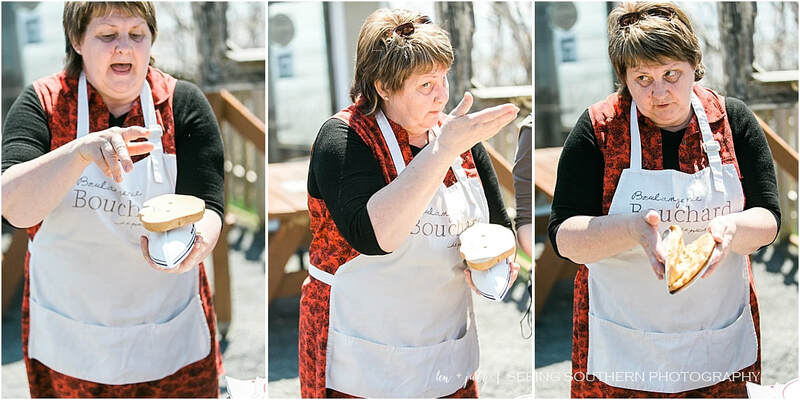 Since 1945, Boulangerie Bouchard perched on the river’s banks in this out-of-the-way world has been pampering the island with baked breads, pies and sweetness; however, it wasn’t until 2007 that this small enterprise became Nicolle-Ange’s. Instantly, it became clear as to why the Diet Coke was so important. It was simply a drink to me. She never disclosed the number of years or prayers she raised, but the ache in her voice confirmed that it had been a sometimes discouraging process for even the simplest pleasure of quenching a patron’s thirst and baking her bread. Getting it right was the least she could do. With camera in hand, I walked toward her to thank her for her hospitality. “I enjoyed your food and your stories,” I said. “And look.” I raised my camera, showing her a close-up made during the throes of her sugar anecdote. “That’s the best picture anyone has ever taken of me,” she said adoringly in her lyrical Canadian French. Whether or not that was true, I had my doubts, but for a second, I believed. Just as I had believed that I would get my Diet Coke. Just as she believed that if she was diligent, one July would come to mean more than a calendar date and a prayer raised. As we climbed back into the little van that seemed much smaller than when we had arrived, we drove away from this roadside discovery that, truly, was on an island in the middle of nowhere. Of all the people I had met in this northern Canadian province, it would be Noelle-Ange that I would remember. More than her stories and her pies, Noelle-Ange reminded me of the reason I travel and why it is the people, not solely the destination that enriches my life. With each flip of the hand and smash of the pie, I connected to her way of life, her community, and that dream she so passionately shared. And I knew, I would never again reach for a Diet Coke without thinking of Noelle-Ange. To experience more of charming Charlevoix, visit their website.